Definition at line 41 of file MipsInstrInfo.h. Definition at line 49 of file MipsInstrInfo.h. Definition at line 39 of file MipsInstrInfo.cpp. 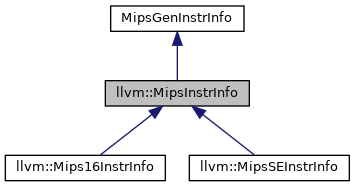 Implemented in llvm::Mips16InstrInfo, and llvm::MipsSEInstrInfo. Referenced by llvm::MipsFrameLowering::eliminateCallFramePseudoInstr(), and loadRegFromStackSlot(). Definition at line 94 of file MipsInstrInfo.cpp. References llvm::MachineInstrBuilder::add(), llvm::MachineInstrBuilder::addMBB(), assert(), BT_Indirect, BT_None, llvm::BuildMI(), isReg(), and llvm::ArrayRef< T >::size(). Definition at line 190 of file MipsInstrInfo.cpp. References llvm::SmallVectorTemplateCommon< T, typename >::begin(), BT_Cond, BT_CondUncond, BT_Indirect, BT_NoBranch, BT_None, BT_Uncond, llvm::MachineInstr::eraseFromParent(), llvm::MachineOperand::getMBB(), llvm::MachineInstr::getOpcode(), llvm::MachineInstr::getOperand(), I, llvm::SmallVectorImpl< T >::insert(), llvm::MachineInstr::isIndirectBranch(), llvm::MachineInstr::isUnconditionalBranch(), llvm::SmallVectorTemplateBase< T, bool >::pop_back(), llvm::SmallVectorTemplateBase< T, bool >::push_back(), llvm::MachineBasicBlock::rbegin(), and llvm::MachineBasicBlock::rend(). Definition at line 43 of file MipsInstrInfo.cpp. References llvm::createMips16InstrInfo(), llvm::createMipsSEInstrInfo(), and llvm::MipsSubtarget::inMips16Mode(). Definition at line 807 of file MipsInstrInfo.cpp. Definition at line 680 of file MipsInstrInfo.cpp. References assert(), llvm::TargetInstrInfo::findCommutedOpIndices(), llvm::MachineInstr::getDesc(), llvm::MachineInstr::getOpcode(), llvm::MachineInstr::getOperand(), llvm::MachineInstr::isBundle(), and llvm::MachineOperand::isReg(). Create an instruction which has the same operands and memory operands as MI but has a new opcode. Definition at line 594 of file MipsInstrInfo.cpp. References llvm::MachineInstrBuilder::add(), llvm::MachineInstrBuilder::addImm(), llvm::MachineInstrBuilder::addSym(), llvm::BuildMI(), llvm::MachineInstrBuilder::cloneMemRefs(), llvm::MachineInstrBuilder::copyImplicitOps(), E, llvm::MachineOperand::getMCSymbol(), llvm::MachineOperand::getTargetFlags(), I, llvm::MachineOperand::isMCSymbol(), llvm::MipsII::MO_JALR, llvm::MachineInstr::RemoveOperand(), and TRI. Determine the opcode of a non-delay slot form for a branch if one exists. Return the corresponding compact (no delay slot) form of a branch. Definition at line 438 of file MipsInstrInfo.cpp. References B, llvm::MipsSubtarget::getABI(), llvm::MipsABIInfo::GetZeroReg(), llvm::MipsSubtarget::hasMips32r6(), llvm::MipsSubtarget::inMicroMipsMode(), and Subtarget. Return the number of bytes of code the specified instruction may be. Definition at line 576 of file MipsInstrInfo.cpp. References llvm::MachineInstr::getDesc(), llvm::MachineOperand::getImm(), llvm::TargetMachine::getMCAsmInfo(), llvm::MachineInstr::getOpcode(), llvm::MachineInstr::getOperand(), llvm::MachineBasicBlock::getParent(), llvm::MachineInstr::getParent(), llvm::MCInstrDesc::getSize(), llvm::MachineOperand::getSymbolName(), llvm::MachineFunction::getTarget(), llvm::ISD::INLINEASM, and llvm::ISD::INLINEASM_BR. Definition at line 65 of file MipsInstrInfo.cpp. References llvm::AMDGPU::HSAMD::Kernel::Arg::Key::Align, assert(), llvm::MachineOperand::CreateImm(), llvm::MachinePointerInfo::getFixedStack(), llvm::MachineFunction::getFrameInfo(), llvm::MachineFunction::getMachineMemOperand(), llvm::MachineOperand::getMBB(), llvm::MachineInstr::getNumExplicitOperands(), llvm::MachineFrameInfo::getObjectAlignment(), llvm::MachineFrameInfo::getObjectSize(), llvm::MachineInstr::getOperand(), llvm::MachineBasicBlock::getParent(), and llvm::SmallVectorTemplateBase< T >::push_back(). Referenced by llvm::MipsSEInstrInfo::loadRegFromStack(), llvm::Mips16InstrInfo::loadRegFromStack(), loadRegFromStackSlot(), llvm::MipsSEInstrInfo::storeRegToStack(), and llvm::Mips16InstrInfo::storeRegToStack(). Definition at line 812 of file MipsInstrInfo.cpp. References llvm::makeArrayRef(), llvm::LanaiII::MO_ABS_HI, llvm::LanaiII::MO_ABS_LO, llvm::MipsII::MO_CALL_HI16, llvm::MipsII::MO_CALL_LO16, llvm::MipsII::MO_DTPREL_HI, llvm::MipsII::MO_DTPREL_LO, llvm::AArch64II::MO_GOT, llvm::MipsII::MO_GOT_CALL, llvm::MipsII::MO_GOT_DISP, llvm::MipsII::MO_GOT_HI16, llvm::MipsII::MO_GOT_LO16, llvm::MipsII::MO_GOT_OFST, llvm::MipsII::MO_GOT_PAGE, llvm::MipsII::MO_GOTTPREL, llvm::MipsII::MO_GPOFF_HI, llvm::MipsII::MO_GPOFF_LO, llvm::HexagonII::MO_GPREL, llvm::MipsII::MO_HIGHER, llvm::MipsII::MO_HIGHEST, llvm::MipsII::MO_JALR, llvm::MipsII::MO_TLSGD, llvm::MipsII::MO_TLSLDM, llvm::MipsII::MO_TPREL_HI, and llvm::MipsII::MO_TPREL_LO. Predicate to determine if an instruction has a forbidden slot. Predicate for distingushing instructions that have forbidden slots. Definition at line 571 of file MipsInstrInfo.cpp. References llvm::MachineInstr::getDesc(), llvm::MipsII::HasForbiddenSlot, and llvm::MCInstrDesc::TSFlags. Definition at line 120 of file MipsInstrInfo.cpp. References llvm::MachineInstrBuilder::addMBB(), assert(), llvm::BuildMI(), llvm::ArrayRef< T >::empty(), llvm::ArrayRef< T >::size(), and UncondBrOpc. Insert nop instruction when hazard condition is found. insertNoop - If data hazard condition is found insert the target nop instruction. Definition at line 58 of file MipsInstrInfo.cpp. Determine if the branch target is in range. Definition at line 278 of file MipsInstrInfo.cpp. References B, llvm::isInt< 8 >(), and llvm_unreachable. Definition at line 50 of file MipsInstrInfo.cpp. References llvm::MachineOperand::getImm(), insertNoop(), and llvm::MachineOperand::isImm(). Referenced by llvm::MipsSEInstrInfo::isLoadFromStackSlot(), llvm::MipsSEInstrInfo::isStoreToStackSlot(), and loadRegFromStackSlot(). Definition at line 120 of file MipsInstrInfo.h. References adjustStackPtr(), llvm::createMips16InstrInfo(), llvm::createMipsSEInstrInfo(), decomposeMachineOperandsTargetFlags(), findCommutedOpIndices(), llvm::ISD::FrameIndex, genInstrWithNewOpc(), GetMemOperand(), getSerializableDirectMachineOperandTargetFlags(), I, isZeroImm(), loadRegFromStack(), MI, op, storeRegToStack(), TRI, and verifyInstruction(). Definition at line 154 of file MipsInstrInfo.cpp. References assert(), I, llvm::MachineBasicBlock::rbegin(), and llvm::MachineBasicBlock::rend(). reverseBranchCondition - Return the inverse opcode of the specified Branch instruction. Definition at line 182 of file MipsInstrInfo.cpp. References assert(), getOppositeBranchOpc(), and llvm::SmallVectorBase::size(). Predicate to determine if an instruction can go in a forbidden slot. Predicate for distingushing between control transfer instructions and all other instructions for handling forbidden slots. Consider inline assembly as unsafe as well. Definition at line 563 of file MipsInstrInfo.cpp. References llvm::MachineInstr::getDesc(), llvm::MipsII::IsCTI, llvm::MachineInstr::isInlineAsm(), and llvm::MCInstrDesc::TSFlags. Referenced by llvm::MipsSEFrameLowering::emitPrologue(), loadRegFromStackSlot(), and storeRegToStackSlot(). Definition at line 112 of file MipsInstrInfo.h. Perform target specific instruction verification. Definition at line 758 of file MipsInstrInfo.cpp. References llvm::AArch64ISD::EXT, llvm::MachineInstr::getOpcode(), Subtarget, llvm::MipsSubtarget::useIndirectJumpsHazard(), and verifyInsExtInstruction(). Definition at line 45 of file MipsInstrInfo.h. Referenced by llvm::MipsSEInstrInfo::adjustStackPtr(), llvm::MipsSEInstrInfo::copyPhysReg(), llvm::MipsSEInstrInfo::expandPostRAPseudo(), getEquivalentCompactForm(), llvm::MipsSEInstrInfo::loadImmediate(), llvm::MipsSEInstrInfo::loadRegFromStack(), and verifyInstruction(). Definition at line 46 of file MipsInstrInfo.h.